Astrology is fundamentally about the symbolic uniqueness of a moment in time. Anyone with an open mind who is prepared to take a little time to contemplate the symbols will be rewarded with an extraordinarily simple but powerful recognition of order and beauty. The problem is, this is not how most people are trained to do what they call thinking. Most of us are aware that we use only a very small part of our brain’s potential. It is difficult to talk in terms of levels of brain activity, but Capricorn Research feels that our thinking processes are too dominated by the level of the brain that is chiefly concerned with the survival of our individual organism. To explain this a little, our brain is continually checking experience that comes to us in terms of similarity or difference to what we are expecting. This is vitally important because without it we would not be able to cross a road without being instantly killed, particularly if the drivers of the vehicles on that road were operating under similar conditions. Our eyes pick up visual clues which are transported to the brain which is able to check all previous experience of what it believes are similar situations to produce the information that the oblong red object in the corner of our vision will take roughly 10 seconds to reach our intended path whereas the silvery grey one would reach the same point in a quarter of the time. Therefore if we step off the curb at this point our life expectancy has been reduced considerably from the old three score and ten years, whereas if we withhold our intention to move for a further 2.8 seconds, we have a 98.5% chance of still reaching our free bus pass. This incredibly complex series of comparisons and calculations is obviously going on all the time, most of it is occurring beneath our consciousness. The trouble is we have, without realising it become ruled by this level of thinking. So every experience that we pick up is automatically projected through this cause and effect threshing machine. Every piece of information received is given the once over in terms of what does this mean to the survival of our organism and our own opinions and views about life. Comparison is the basis of all of our thinking. We cannot compute uniqueness, our brain instantly has to compare anything received with previous experience in order to ascertain whether it is a threat or not. So called scientific thinking is entrenched in this mode. If one silvery grey rectangular box travelling at x mph and at y distance constitutes a threat to our individual organism than anything that appears similar to our eyes must contain the same danger. So therefore anyone who has 5 planets in the 8th house including Mars, Pluto and an exact Moon / Saturn conjunction must be a serial killer because Peter Sutcliffe had that combination. The most difficult thing that faces all astrologers is that they are having to use a series of symbols that are unique to a moment and to translate these symbols in a way that is of some help to clients whose patterns of thinking are utterly opposite. This is a particular problem for anyone involved in astrological research because people need to see that the same symbol has the same result at least 90% of the time. For example if a Mars / Jupiter conjunction in the 10th house is a symbol of career success all individuals with this contact should always reach the top of their chosen profession. But an astrological chart is unique. That particular Mars / Jupiter conjunction is unlike any other that has occurred in history owing to its angular connections with so many other bodies. Of course most astrologers manage to get through all this because their experience tells them that there is enough in common with other similar aspects to be able to make helpful general comments with a reasonable degree of confidence. But most astrologers are put off doing statistical research because they feel the uniqueness of the subject just cannot be squeezed into the narrow perspective that is required. Fortunately Capricorn Research has enough personal familiarity with narrow perspective to be able to maintain a foot in both camps. But every so often a chart comes up that defies the need to compare it with others. The symbolism works so beautifully for its own sake. 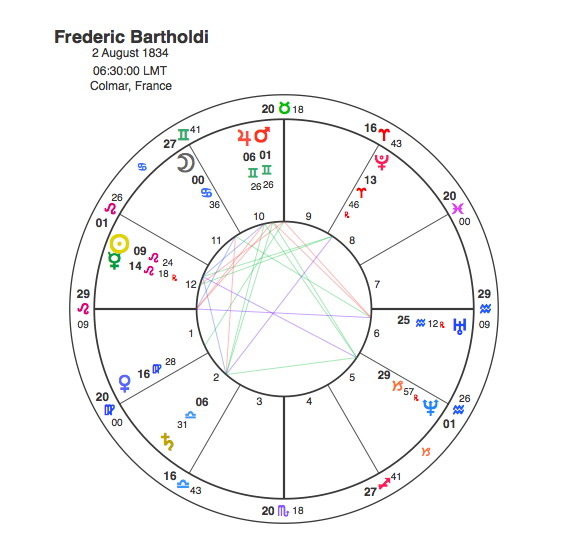 Bartholdi has the Mars / Jupiter conjunction and he did rise to the top of his profession. Indeed as a designer of statues its hard to imagine anyone doing better than Liberty. But this Mars / Jupiter symbol says so much more. When an individual is so strongly identified by a particular achievement, their chart can often be read as a description of their work. This is certainly the case with actors who are known for one major role in their career. So Bartholdi’s chart works not only for him but also for the Statue of Liberty itself. And in that case its entirely appropriate that Jupiter, the symbol of freedom is given such a powerful elevated position. It’s also interesting that its in Gemini, because the symbol for this sign is the only one that represents a structure, with two parallel columns. The Mars / Jupiter conjunction is trine to Saturn. Mars trine Saturn is the aspect of a builder, someone who can give concrete form to an idea and with Jupiter involved we have a master builder. Mars, Jupiter and Saturn are part of a Grand Trine including Neptune, so this is not just any ordinary statue. Neptune’s inclusion gives it spiritual inspiration. It gives the statue a meaning and a symbolism that is very powerful. The Grand Trine is the most auspicious aspect in astrology. It invokes a coming together of different planetary energies to be blended in a harmonious constructive fashion. Liberty herself is the Mars / Jupiter conjunction the torch of freedom that is offered to all. Gemini is the sign that wants to communicate with everyone. What better symbol of the poor than Saturn, the planet of limitation in the 2nd house of money ? And all these poor, huddled masses are approaching from the sea so this suggests Neptune. Not only that but these masses are yearning to breathe free. Neptune is often symbolic of slavery and the dream of emancipation. Mars and Jupiter welcomes these Saturn and Neptune figures and its placing in the 10th house gives them real aspiration and the hope of success. To top it all off, the Grand Trine forms a Kite with the Sun at the beginning of Leo, the most noble and generous of all placings. It says that no matter how lowly you are and where you come from, you can aspire to the highest peak of all. This Grand Trine / Kite is the true symbol of the American Dream. Gemini, above all else is a sign of movement. Pluto was in Gemini from 1882 to 1914, this period witnessed massive immigration into the US. The Statue of Liberty was finished in 1886 and was a profound symbol of this era. It was unveiled as Pluto conjunct Bartholdi’s Mars. The wonderful thing about astrology is that if we take time to genuinely contemplate the symbols of an individual chart we can clearly see how they work in practice. But this is not enough for many people. Unless they see clear evidence that manifestation of these symbols fits within their already tightly defined linear constructs, they will be dismissed as nonsense. So called scientists would only accept an astrological effect if everyone born at the same time acted in the same manner. So rather than there being just one Statue of Liberty they would have to be sprouting up out of the sea all over the world like some horrific global offshore windfarm. They would not accept that other people born on the same day as Frederic Bartholdi could manifest the Mars / Jupiter / Saturn / Neptune symbolism in a different way, whilst still being consistent with the principle. They would probably criticise astrology as something that enslaves people and takes away their independence of thought and action. They do not realise that the thing that really enslaves people is their addiction to this linear, cause and effect, what’s in it for the continuation of my own tiny piece of the Universe, thinking. Just like Frederic Bartholdi’s statue, astrology opens its arms to the poor huddled masses and offers a way out of this slavery. For the human mind, Astrology is Liberty.